Please note: a number of serving Australian Army officers and soldiers were interviewed for this piece. Their names have been withheld at their request. Last November the Minister for Defence Materiel, Jason Clare, announced that Australian troops operating in Afghanistan would be issued with Crye Precision MultiCam uniforms, following a successful trial. 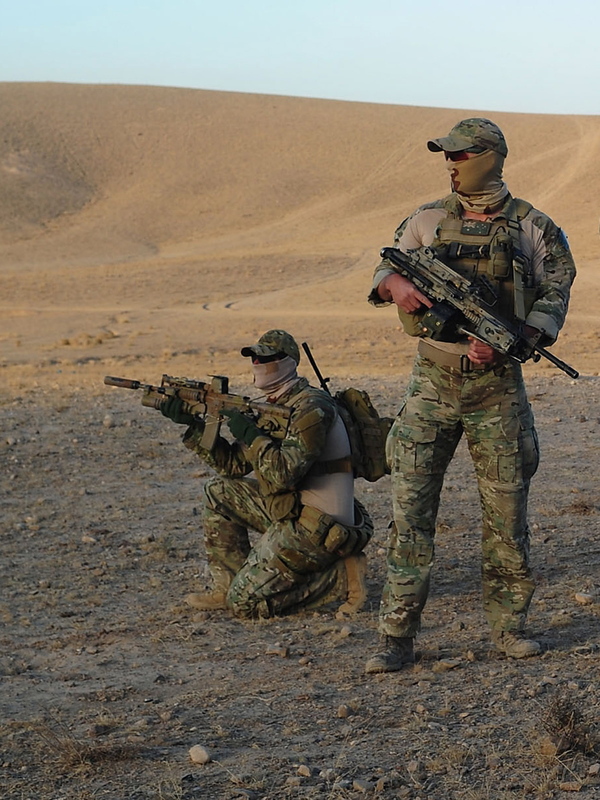 Australian special operations units had been wearing the pattern for some time, and the decision to expand its use to all troops in the theatre was a direct result of the positive feedback received by SOTG members. In late May of this year Chief Executive of the Defence Material Organisation, Dr Stephen Gumley, announced that the DMO had reached “an arrangement with the Crye company for them to design an Australian version of their pattern in the various materials”. There have, however, been concerns about the final design, colouration and testing of the pattern, and some concerns from local industry and politicians. The current, US-issue MultiCam pattern is already in service with a number of militaries, law enforcement organisations and private companies. The US Special Operations Command have been using the pattern for years now, and MultiCam had previously featured in various iterations of the US Army’s futuristic Future Force Warrior/Land Warrior program (cancelled in 2007). Some of the first ‘real world’ adoptions of the camouflage came from the private sector, however. Blackwater tested MultiCam with some of its teams early on and featured the pattern in its ‘Pro Shop’ also (leftover product). Private contractors I have spoken to and worked with have also recognised the utility of MultiCam in Afghanistan, despite the tendency to avoid camouflage patterns. The pattern is also in use with the US Immigration and Customs Enforcement Special Response Teams and a number of other US law enforcement agencies, some units of the British military (whilst awaiting the roll-out of their very own licensed Crye pattern, MTP) and the Australian Federal Police. The UK has also adopted a variation of MultiCam. The Ministry of Defence’s Defence Science and Technology Laboratory (DSTL) investigated the effectiveness of ten different camouflage patterns under the PECOC (Personal Equipment Common Operating Clothing) program. The assigned team conducted a wide range of tests, used computer modelling, developed several experimental techniques and tested the pattern in the UK, Cyprus, Kenya and Afghanistan. MultiCam, already in use by UK special operations forces, was the stand out of the test group. Crye was then asked to develop an exclusive pattern for the UK MoD. As one Crye representative said: “MultiCam won all their trials so they wanted us to develop a pattern for them that performed like MultiCam but had a distinctly British identity. UK-MTP is the result”. The pattern itself, properly called Multi-Terrain Pattern, features the familiar MultiCam colour palette in a design featuring brush-like strokes reminiscent of its predecessor, British Disruptive Pattern Material (DPM). The new Australian pattern will be developed for the ADF by Crye at a cost of US$3.1 million. Additionally, Defence will be licensing the rights to manufacture uniforms in the existing pattern, for a sum of US$4.7 million. The Australian pattern will be known as ‘Australian MultiCam Pattern’ (AMP). At this stage it is unclear whether AMP will feature the current MultiCam palette in a distinctly Australian pattern, in a similar approach to the UK’s MTP, or will also feature a colour range modified for Australian terrain. It is also unclear how widely uniforms in the new pattern will be distributed, and whether they will be issued for use in Australian terrain. Previous proposals, however, have not fared so well. Around late March and early May of last year, a number of sources began reporting on the Australian Army’s field testing of a new ‘mid-point’ camouflage uniform, designed to “better meet the range of environments deployed troops are encountering”. Disruptive Pattern Midpoint Uniform (DPMU), or ‘vomit cams’ as two of the serving soldiers I interviewed referred to it, was a DSTO (Defence Science and Technology Organisation) project to develop an ‘Australian’ pattern camouflage in a colourway optimised for semi-arid regions. There were allegations made during the testing of this pattern that it had essentially been pre-selected for distribution, regardless of the outcome of the field testing. It was also stated that other patterns (the “US and UK solutions”) were undergoing testing at the same time as DPMU, however the AMP pattern was not mentioned at this stage. Australian troops I spoke to have mixed feelings about the idea of introducing a new ‘Australian MultiCam’ to replace the DPCU pattern. The utility of the current-issue MultiCam pattern for overseas deployments – referred to in Australian service as Crye Precision Camouflage Uniform (CPCU) – has been widely acknowledged by Australian troops. As one serving Australian Army officer put it: “The MultiCam pattern is excellent for Afghanistan because of the relatively small distance between desert areas and green zones there, and the fact that we often have to operate in both of those areas as part of one operation”. However, the same officer went on to say that whilst the utility of the pattern for work in Afghanistan was widely acknowledged, there was an uncertainty as to how well the current colour palette would suit the Australian bush. DPCU, based on aerial photographs of Australian terrain and designed specifically for the country’s bushlands, is held in high regard by many of our troops. A serving digger interviewed stressed that DPCU is ideally suited for use in Australia and that, in his opinion, MultiCam (as it stands) should be reserved for troops deploying overseas. While it is unlikely, due to issues of cost, that two sets of uniforms (and spares) will be issued to all Australian-based ADF personnel, it may be that MultiCam is issued in anticipation of overseas deployment. It will be interesting to see how the balance will be struck. The Crye uniforms currently being issued have gained a lot of their popularity with troops not just from the MultiCam pattern, but from the design of the uniforms themselves. Of course, there have been a few hiccups, notably in sizing. Nonetheless, several serving troops and officers I spoke with pointed out a number of design features that were very popular. The rip-stop fabric, location of pockets, knee and elbow padding, and cooler fabric designed for use under body armour were the stand-out features. It should be noted that these features are not exclusive to Crye’s range of products, and could be incorporated into uniforms produced in Australia using a licensed Crye pattern, or any other camouflage design. There has been some outcry (see comments section here) about the non-competitive adoption of a foreign camouflage pattern. The Shadow Defence Minister, David Johnston, has also asked for comment on the matter. Unfortunately for Australian designers and producers, MultiCam has a noted track record and enjoys a high-level of support from the troops. Of course, if the new AMP pattern turns out to be very similar to DPCU but featuring Crye’s colour palette (in the same vein as the UK’s MTP), one could reasonably ask why such a relatively minor change couldn’t have been conducted by an Australian company. Additionally, a shift towards Crye patterns by the US, UK, private sector companies and now Australia has the added effect of diminishing differences in appearance between various Western militaries. One thing is for sure though, Crye Precision continues to represent what Western militaries believe is the vanguard of camouflage design, and will no doubt continue to be financially successful as a result. For the new AMP pattern to be successful it will require proper theoretical and operational testing in the environments it is expected to serve. If we decide to issue such a pattern to troops stationed in Australia, then it is my sincere hope appropriate tests are conducted in Australian terrain. Wise doctrinal guidance outlining the scope of deployment for the new pattern will also be necessary, and it will be interesting to see whether we arrive at a pattern designed to replace DPCU, or a pattern designed specifically for expeditionary use. Addendum: We may well see an announcement of further details at Defence and Industry 2011, in Adelaide next week (28th – 30th June). This piece has also appeared at KitUp! Jumping The Gun: what does the AK-100 series really mean for Libya’s rebels? This post originally appeared on the Lowy Institute’s blog The Interpreter. Stephanie Koorey’s piece on Libyan weapon supplies falls short of investigating properly the origin of many of the small arms seen in Libyan rebels’ arsenals. The star of Koorey’s piece – an ‘AK-100 series’ rifle shown in this Al Jazeera video clip – leads her to reasonably ask, ‘where are these from?’ Eastern Europe? South and Central Asia? Perhaps even South America? However, there exist possibilities closer to the conflict, and more to the story. The gun in question is certainly an AK-103; the muzzle brake design and barrel length are different on the AK-102, AK-104, and AK-105, and the AK-101 and AK-74M are chambered for 5.56x45mm and 5.45x39mm, respectively, and feature correspondingly straighter magazines. The state-controlled Gafat Armament Engineering Complex in Ethiopia has been producing AK-103s for some time now as the ET-97/1 Automatic Rifle. Arms movement between the two countries has been well documented, though it is not extensive. 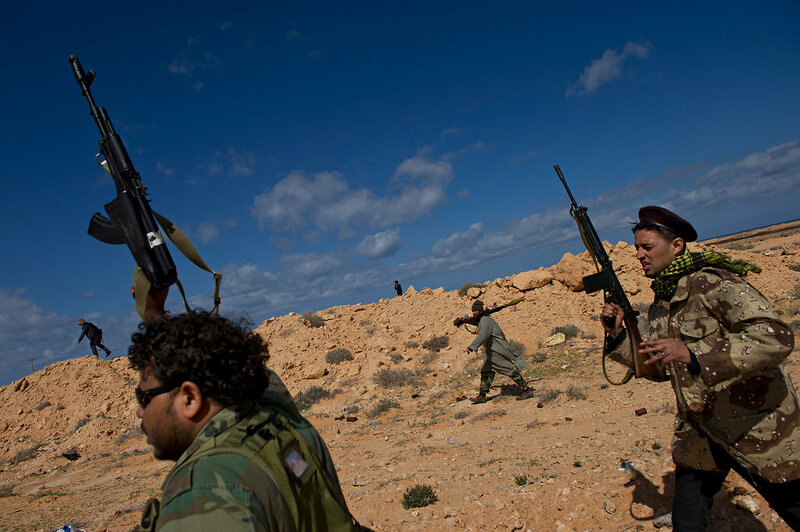 Another distinct possibility is that the rifles may well have come from within Libya itself. We know the Libyan government planned to manufacture AK-103s under license, and it is likely that samples were sent over from Russia for assessment purposes. It is even possible that a pre-production run was manufactured within Libya. We’ve certainly seen pro-Qadhafi forces using the AK-103, which lends weight to this theory. Koorey’s assertion that this “makes the Libyan rebels the first known non-state combatants to have AK-100s” is also untrue. There have been confirmed reports of non-state combatants using AK-100 series weapons in Chechnya (and probably Ingushetia), in Colombia (by FARC rebels, and likely by the ELN and cartels as well) and in other conflict zones. Private security contractors in both Iraq and Afghanistan have made use of Bulgarian 100 series clones. I’d be very surprised if a few examples hadn’t made it into the hands of militants in these or other parts of the Middle East and Central Asia, or in the Caucasus, India or the Balkans. I have also heard personal accounts of AK-100 series rifles being sighted in the hands of Hezbollah fighters, which may well be connected to Iranian military use of AK-103s. Also, given that certain units in the Yemen Army use AK-104s, it wouldn’t be a stretch to imagine a few examples turning up in the hands of Houthi militants or other groups in the region. Bearing in mind production first began in the 1990s, it is not surprising these weapons have been sighted around the world. The fact that countries like Venezuela and India have moved to produce these rifles under license relatively recently only serves to heighten the distribution of the AK-100 series. So how will the presence of AK-103s affect the conflict in Libya? Almost unnoticeably; at this stage we have seen very limited stocks of the weapon. Even should the numbers of 100 series rifles increase, their acknowledged advantages over older AK-family weapons will have very little strategic impact, given the relatively low level of marksmanship training of the combatants involved. Unless the rebel forces can obtain significant numbers of them – and sufficient stockpiles of 7.62x39mm ammunition – we are not going to see this weapons system providing much of an advantage at all. Image courtesy of The New York Times. Libyan Rebel with AK-103 (March 5th 2011). Update 21/06/2011: Stephanie Koorey has a reply to this piece up here. I think she may have missed a few of my points, but I intend to get in touch with her and compare thoughts on the small arms situation in Libya. Update 16/09/2011: It appears the rifles were from Russia, after all. Details here. Update 31/10/2011: Close-up images of the receiver of one of the rifles shows Russian factory markings. Here. While we do not subscribe to all that Raoul Heinrichs proposes in his 31 May Lowy Interpreter post, we feel it necessary to outline our position relative to some of the claims Rodger Shanahan makes in his 1 June rejoinder to Raoul. In short, while Raoul is wrong about the ADF, Shanahan is wrong about strategy. Nowhere in Shanahan’s post does he acknowledge the final note upon which Raoul’s piece actually hinges: that is, there is a need to measure our tactical and operational gains and losses against a clear strategy for Australia’s continued involvement in Afghanistan which, in Raoul’s opinion, is absent. Against a weak strategy, human costs are magnified, and it is the responsibility of those in the strategic realm but more importantly the political realm to do so. In fact, to not do so would violate the very covenant Shanahan holds sacred, that of the social contract between soldier and government. Soldiers do not fight for strategy; on that point Shanahan is correct. But neither do they fight simply to “leave the area for which you have responsibility in better shape than you found it”. This idea in itself is a strategic concern, and certainly not always the goal of warfare. Shanahan appears to use this point as a fulcrum for suggesting that gains made to date directly translate to current strategic imperatives. Of course, these fluctuate with time and circumstance; and we have been in Afghanistan for near on ten, strategically-shifting years. At the end of the day, both Shanahan and Raoul are focussed on the tactical level manifesting in their concern for the welfare of the soldier, except that Shanahan has also left considerations of strategy behind. Postscript: For further views on this debate, Crispin Rovere advances similar arguments to the above in a 2 June Lowy riposte while @ClosetIdealist further teases out Australia’s strategic interests in Afghanistan on a 3 June Pynx blog post. Image courtesy of Department of Defence. 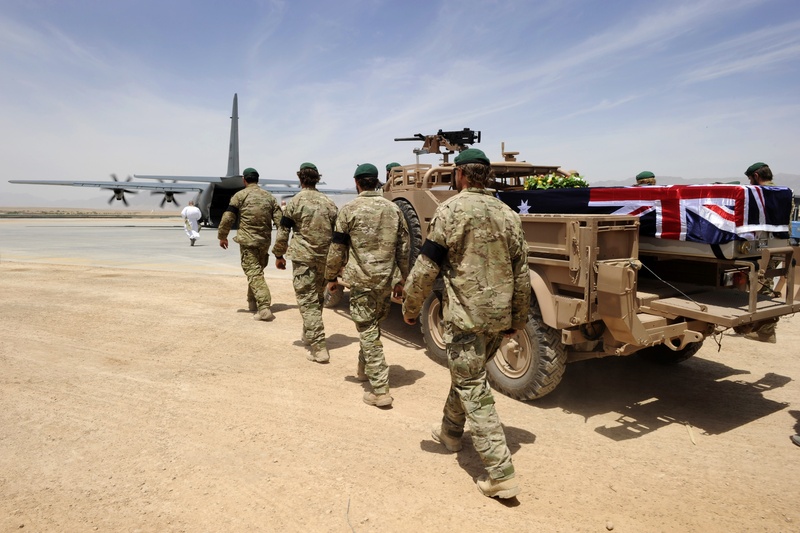 Members of commando SGT Brett Wood’s platoon escorted his coffin at Tarin Kot airfield where a C-130 waited to commence his repatriation.